Yay we made it to Friday!! Some weeks just feel like that, right?! And we are in the thick of it with kid sports and activities with our son. He wants to do it all and we have to be the ones to set the limits, but it’s easier said than done. Do any of you experience that too? I know my husband loves coaching sports and all the awesome community of other parents/kids and the father/son bonding aspect, but it sure makes for a lot when James is also in Karate and rehearsing for the school play. We try to take it day by day and stay organized and on top of things, but some weeks wipe us out! Next semester will be different, she said, already thinking it probably won’t be! I’m just wondering if y’all experience something similar. And I bet it only gets worse when you’re juggling two kids’ schedules or more! I want to share with you how I’ve recently starting using Evernote to help keep me organized, but I’m already rambling on and on, so I think I’ll save that for a future post! 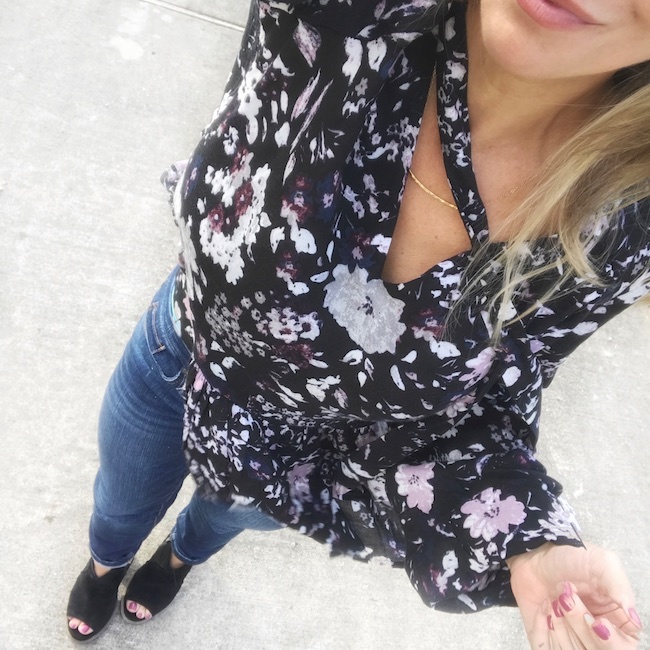 Wow, I didn’t realize it had been so long since I did a round-up of my OUTFITS LATELY here, so today is a big one for ya! It’s full of both warm weather clothes (jean shorts!) and cold weather clothes (long sleeves and scarves!) because Houston is funny like that this time of year. I would say I wish it would make up it’s mind, but I know we just gotta roll with it. I do hope it’s nice and warm for our Spring Break coming up in early March! 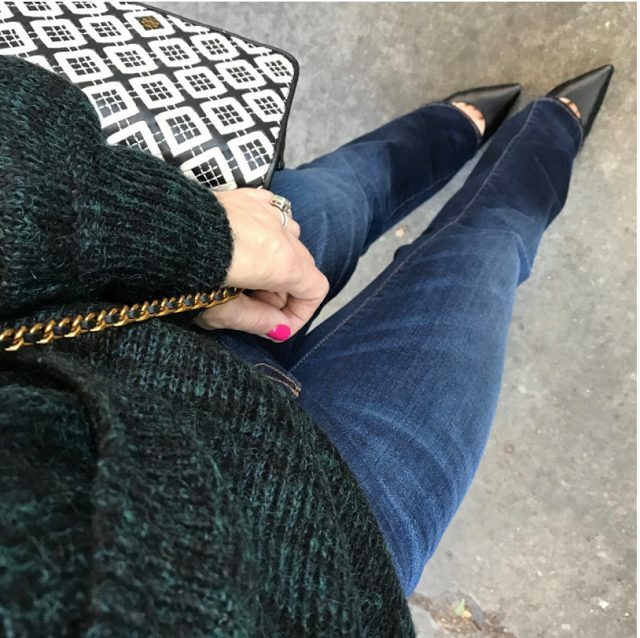 If you want more everyday outfit inspiration, I post my daily outfits on Instagram, which is what I’m rounding up for you here today. These aren’t professionally styled photos, just selfies ? 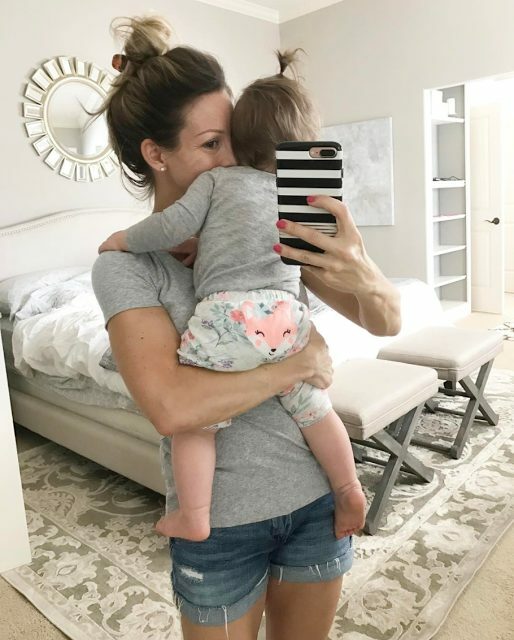 sharing my attempts to get out of jean shorts (it happens sometimes!) and get creative with the things in my closet. 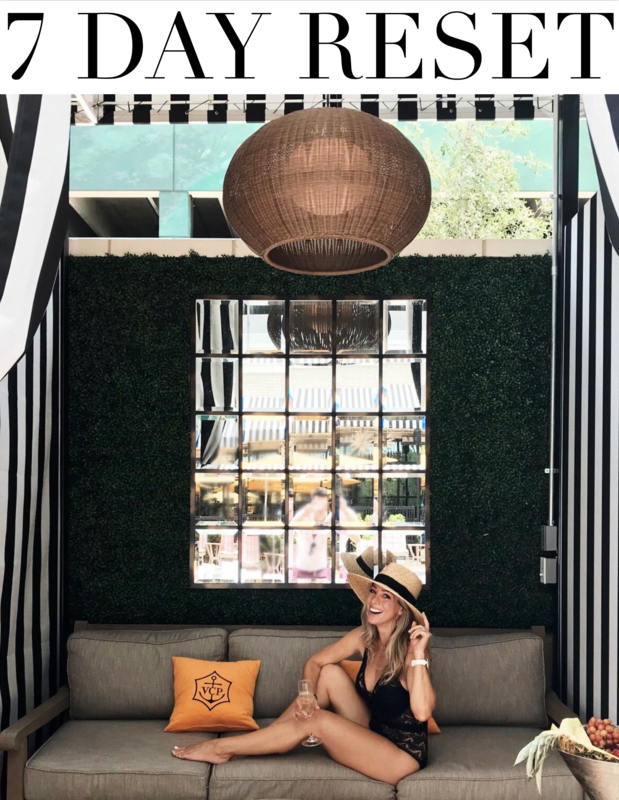 You can shop my instagrams without LikeToKnowIt by clicking the picture on my blog right sidebar. 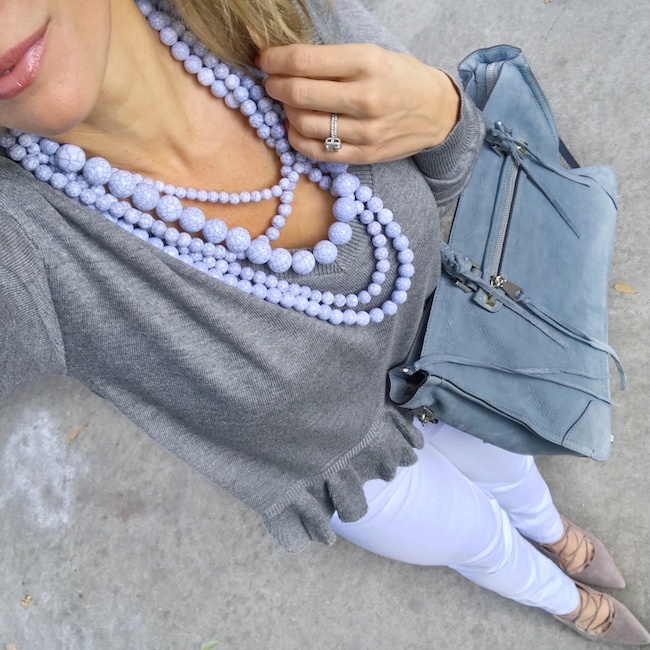 The V-Neck Tee is back in stock and in a new pretty color (called ‘grey mist’, but it actually looks like soft aqua) after selling out so quickly during the Nordstrom Anniversary Sale. It’s super soft and think and looks good with a small tuck in the front. I’m tempted to buy it in black and heather grey too! Never met a ruffle I didn’t like! ? Wearing with my very fave ‘doesn’t-show-lumps-and-bumps’ white jeans! 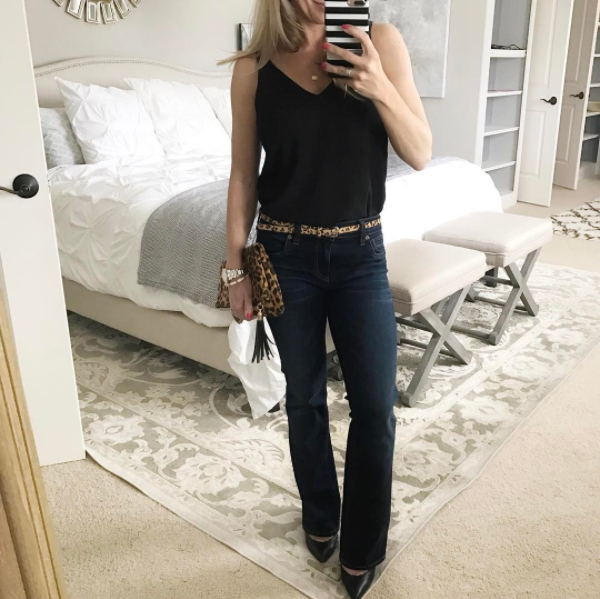 I’ve had these a few years now and they are seriously the best- definitely jeans, not jeggings! If it wasn’t for the crazy wind today?? ?, you could’ve sworn it was summer! ☀️I linked 5 (under $25) fave white tees, I’m wearing the 14th & Union one here. Size down for a slim fit. ? These ‘ohmygoshfavorite’ jeans shorts are, unfortunately, no longer available ?and I’m so bummed because this pair is too big on me now. 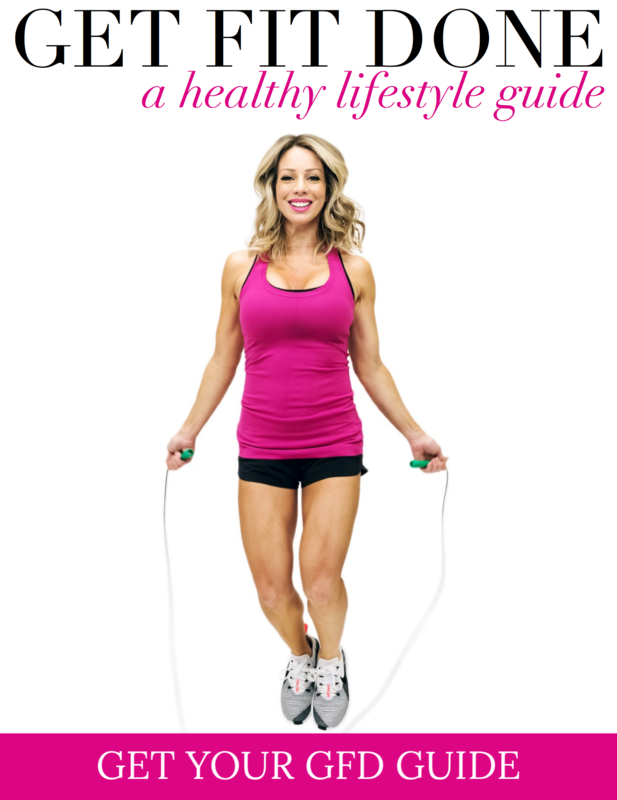 I got them post-partum and now that I’ve lost the baby weight (post coming on that soon!) I wanted to order a size down, but they’re all gone! So, I just ordered two new pair of jean shorts (these & these) and I’ll let you know how they compare. Friday night meant mama got a night off cooking! ? In your house too? ? Top is older so I linked similar. The sister pair to these booties w cute side cutouts are finally on sale! ? 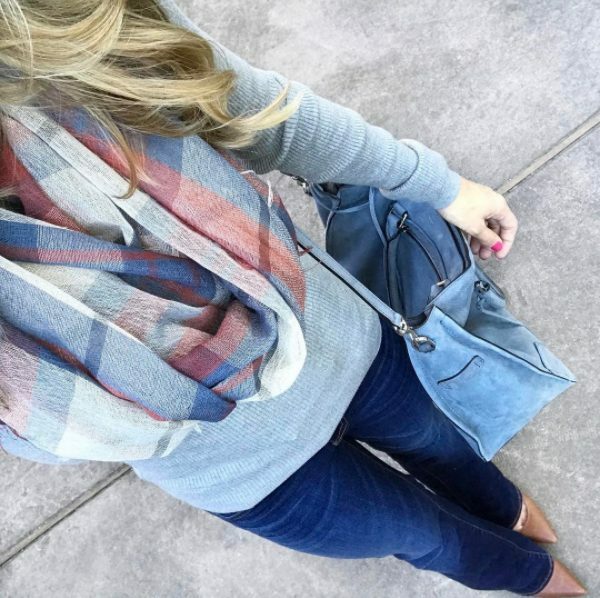 Just when we started getting used to Spring in January, ?it’s back to scarves and sweaters! ? We’ll take it! 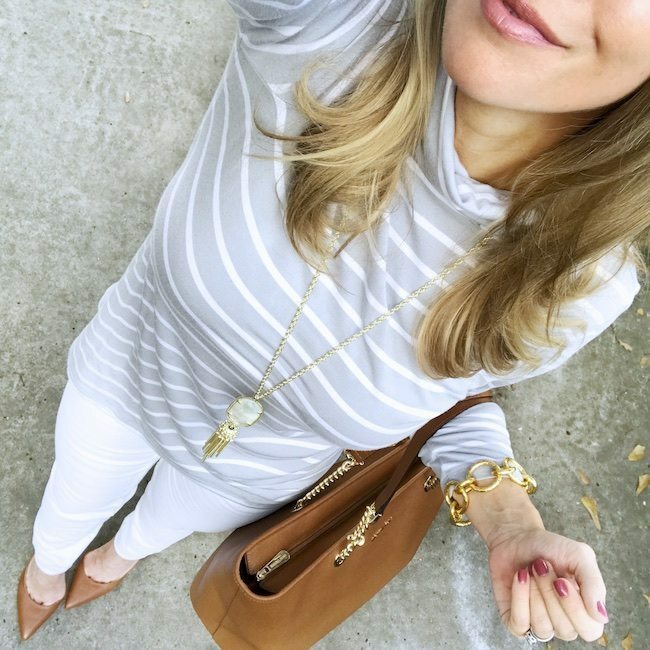 This grey ribbed knit top is a wardrobe staple and goes with everything (comes in black and burgundy too)! It’s really pretty w white jeans or tucked into a skirt. ? Twin top knots today. ?And her little hand on my shoulder gets me every time! ? So many errands run today, including a much needed car wash! ? Even cleaned out my wallet while I waited! ✔️ Felt great to get back in the car and not see dust and cheerios everywhere! ?‍?‍? Monday (light) blues ? with super comfy skinny stretch corduroy pants. I linked my nail polish ? ?that y’all were asking about- it’s OPI ‘lanaiiing around’ it’s a really pretty dusty rose. ?? How ’bout this sweet pale pink sweater for a low-key Valentine’s Day?! ? The little bit of peek-a-boo lace is sewn into the sweater! I’m usually a 4US in this brand, but would size down one, though the sweater is meant to be slouchy. It keeps coming in and out of stock, so check back if they don’t have your size. Houston weather is ???! #whatwinter I guess I shouldn’t complain, get to take the kids to the park today after school. ?‍♂️?‍♂️⚽️Criss cross tee is cute too! It’s lightweight and on the longer side so you can do a mini tuck, fits TTS, XS pictured. Here ya go for those asking about this top from yesterday’s stories. ??? It’s lightweight and on the longer side so you can do a mini tuck, fits TTS, XS pictured. Now go have an awesome Friday! ? 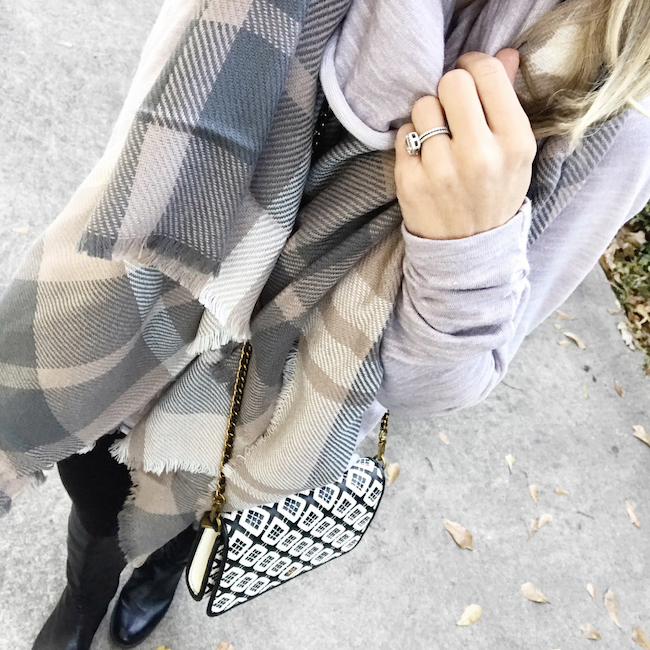 When you don’t get cold weather often, you love to bundle up! 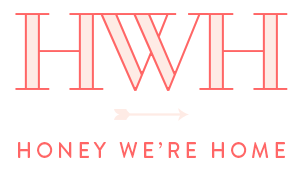 I finally got my Hue wide waistband leggings (only $36!!) and now I see what all the fuss is about! They are awesome! The wider waistband means they are super comfortable on your middle and you don’t even realize you’re wearing them! The fabric is nice and weighty and the XS fit me perfectly with extra length at the bottom for you taller ladies. I can already tell they’ll definitely be a Fashion Fave for 2017! Such a rare, fun Wednesday! First, we celebrated Grandparent’s Day at school. ?Then after school, I swapped the leopard heels for sneakers and we went to the Houston Super Bowl Experience downtown (see on stories)! ??‍?‍?‍? Our city is starting to get wild with excitement for this weekend! ?? ?• this striped sweater tank just went on sale too! 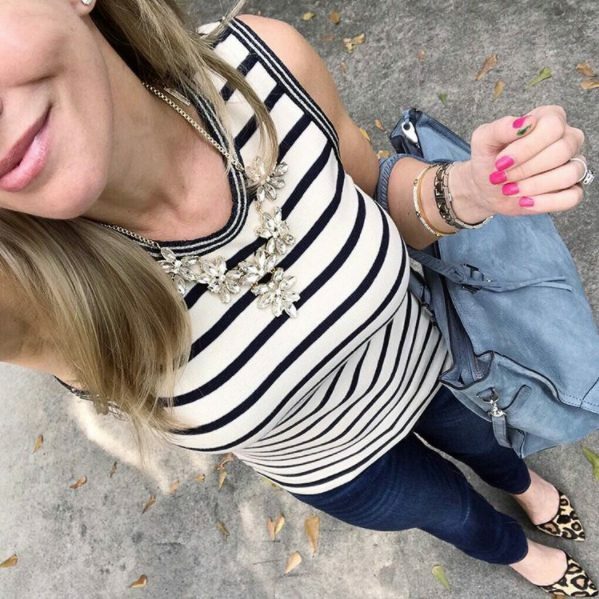 See those awesome leopard flats styled with neutrals here and a date night look here! Top runs small, I’m in US4 and I linked the best strapless bra to wear with it & a lacy bralette you wouldn’t mind peeking out. ?? Jeans stretch with wear so size down, I’m in 0P. 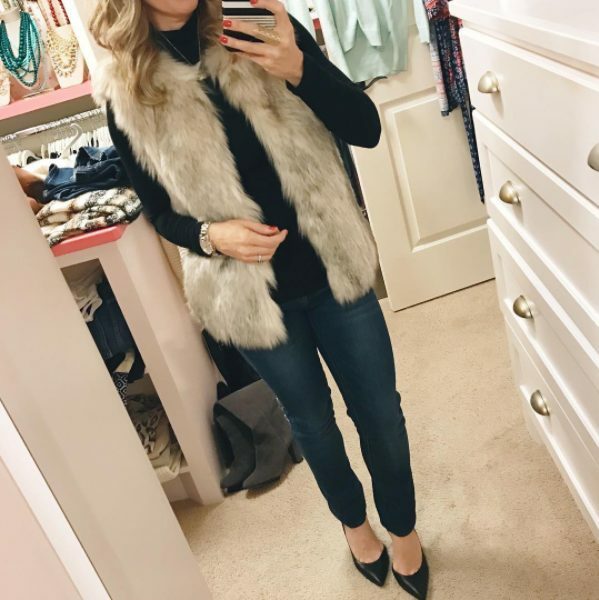 I finally got to bust out the faux fur vest! I wore this on Friday night to the funniest white elephant party I’ve ever been to! ? ?❌#justwrong if you saw on Stories, I’m so sorry about your eyes! ? 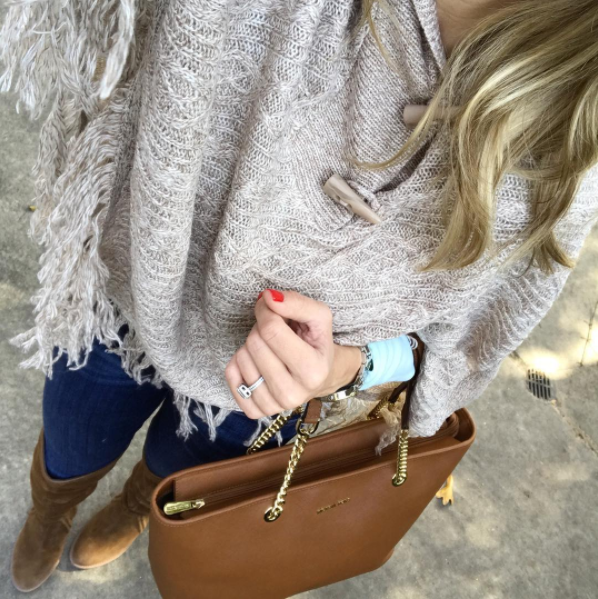 Our sweater days are numbered around here, so throwin’ it back to this sassy crossover sweater! And had to share that this @toryburch geometric crossbody bag has been marked down- 33% off! ??? We were gonna have a nice quiet lunch on Valentine’s Day, but this dress just upped the ante!??❤?? It’s under $50 ? and also comes in black and navy. Fits TTS with lots of stretch, XS pictured. Fulfilling my promises to myself! ? I have 5 1/2 weeks to get back in shape before Jordan’s 1st birthday- looking forward to seeing what we @johnjsherman can accomplish in that time! ?This is the outfit he killed me in today- but capris and top are ?! P.S. Thanks for the spray tan @bbronzedorganic ? Now I don’t feel so pasty! 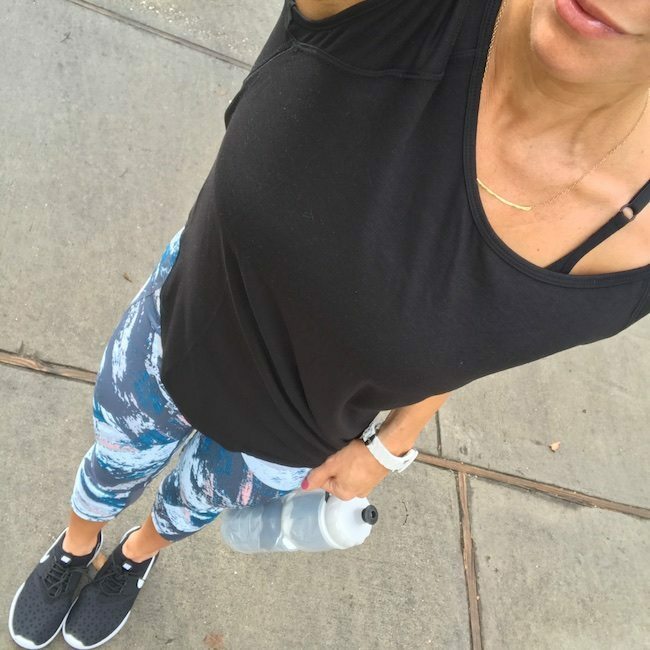 And you’ll love these fun capris because they are ultra comfy and have a high waist that pulls your tummy in! ? Fits TTS, XS here. 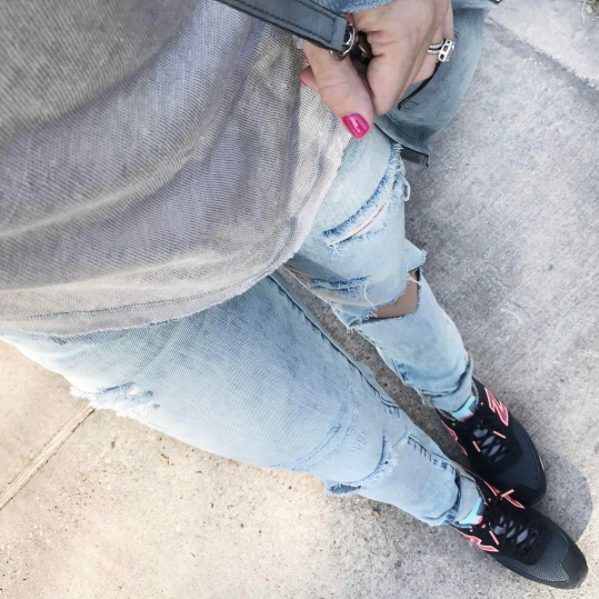 On Wednesdays we wear pink (sneakers)! ? 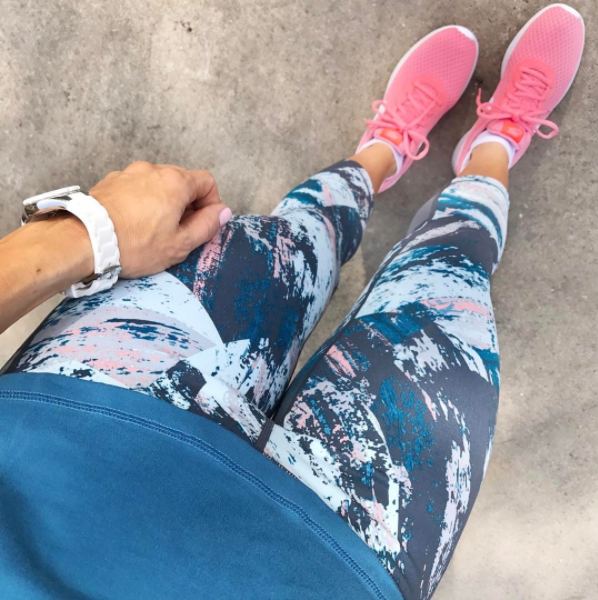 And you’ll love these fun capris because they are ultra comfy and have a high waist that pulls your tummy in! ? Fits TTS, XS here. Phew! That was a lot, right?! 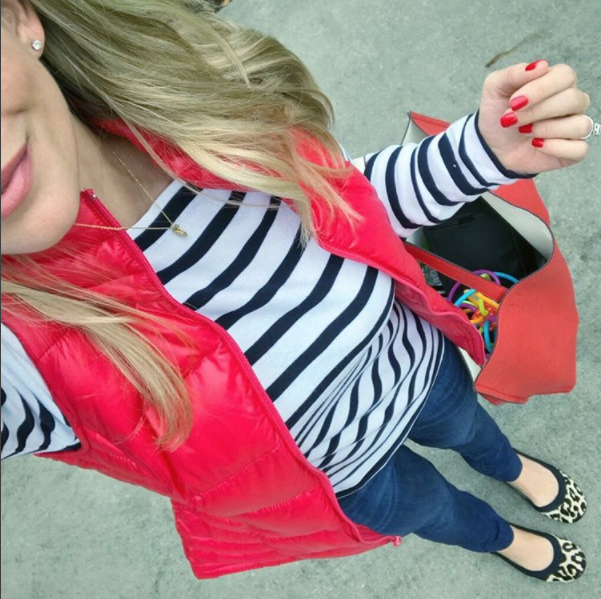 I hope you found some outfit inspiration here! Now off to create some Valentines for my sweet Valentines! Have a great weekend, friends! ? P.S. You can join me on Instagram too, where I post everyday outfits and inspiration to wake up your wardrobe. You look amazing in that red dress! Thank you Kathy! 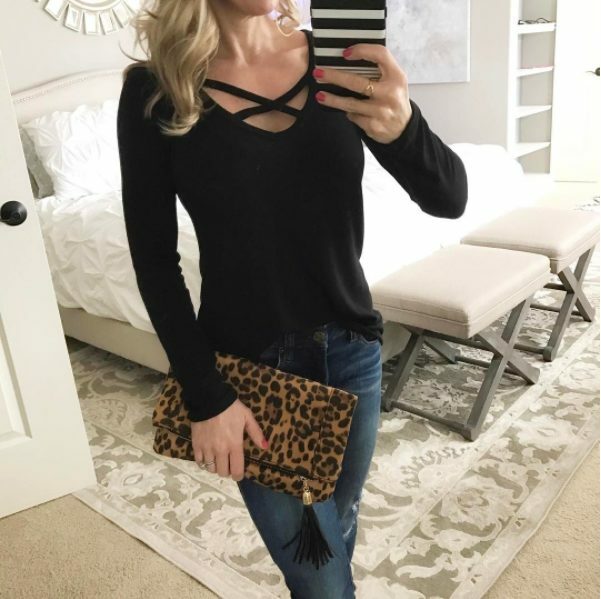 I hope they restock that top- it's really cute in person! 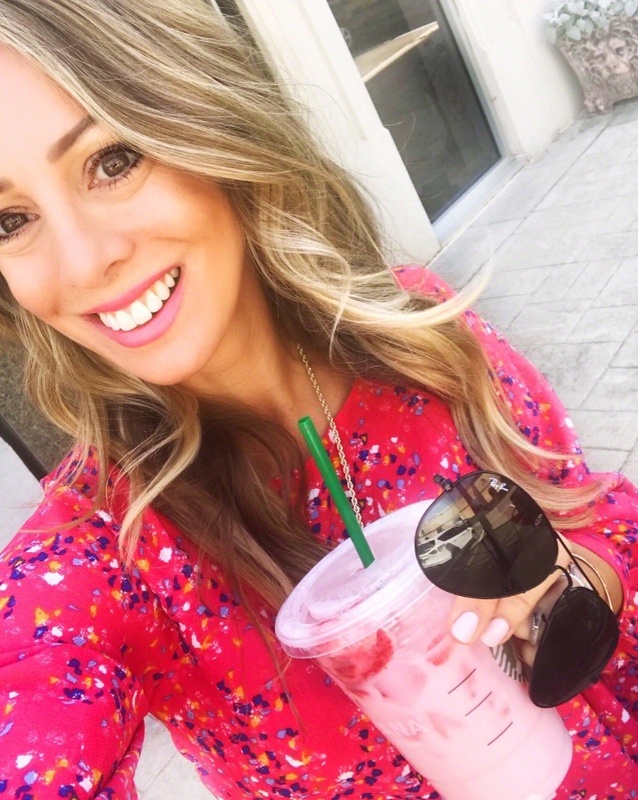 Love your blog & your style!